For a final week of Kausler closet oddities (This column will hopefully return in May, if not sooner) I found a bunch of Zagreb and Japanese treasures I hadn’t seen before – and don’t seem to be online. A man is trying to go to sleep but a noise keeps him up. In the process of trying to stop the noise he exposes a bizarre mixture of sounds and images. Zagreb’s Tup-Tup won multiple international awards and an Oscar nomination in 1973 – losing to Richard Williams A Christmas Carol. Bim Bam Bum (1971) Directed By Zlatko Grgic, Boris Kolar, Ante Zaninovic. Featuring Professor Balthazar, the Zagreb star of series of animated shorts about an old inventor, produced between 1967 and 1978. 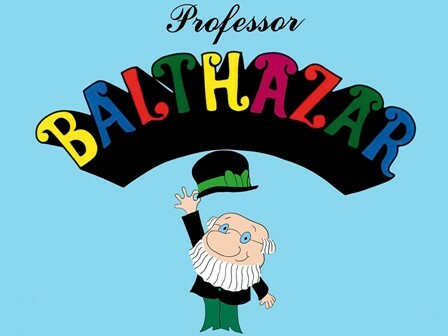 Several Balthazar episodes were telecast on ABC Saturday morning – on Chuck Jones’ Curiosity Shop. The Scribbling Kitten (1957) – Director: Taiji Yabushita and Yasuji Mori. My favorite of this batch. The Scribbling Kitten aka Kitty’s Graffiti (or Koneko no Rakugaki in Japanese) is considered Toei Animation’s first animation short of substance. I don’t know much more about it beyond this: Yasuju Mori was a top animator behind many great early anime features like Little Prince and The Eight Headed Dragon and Alakazam The Great. A wonderful forerunner of the anime explosion to come over the succeeding ten years. The Out-Foxed Fox (1954) – Another from the Medalion package – this time a dubbed anime short from 1954 – still a period that needs to be researched further. If anyone has info on this short – or any of the above – please submit in the Comments Section below. NEXT WEEK: Devon Baxter Returns – and not a moment too soon! TUP-TUP is one of my all-time favorites. 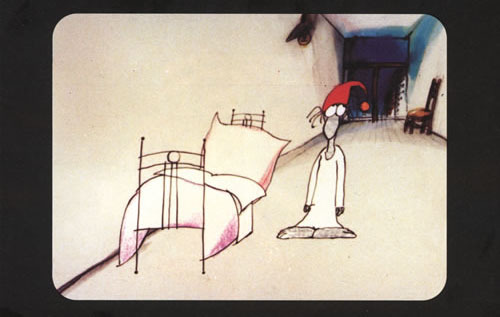 Nedeljko Dragic is an underrated genius of animation, in my opinion. PASSING DAYS (1969) and THE DIARY (1974) are masterpieces. Because I noticed Kausler’s materials tend to come from TV and educational film distributors, I noticed Tup Tup has been edited a bit to remove a few adult scenes in it! here’s a full version! Thanks Vince, For putting up the original version of “Tup-Tup” which I had not seen before. When you see all the naked ladies and especially the last scene in the grave with the frog that becomes a woman, the reason for the little guy’s sensitivity to noise and destructive impulses are obvious! He needs to get laid! In the versions I have, his sensitivity to the tup-tups is mysterious and surreal. 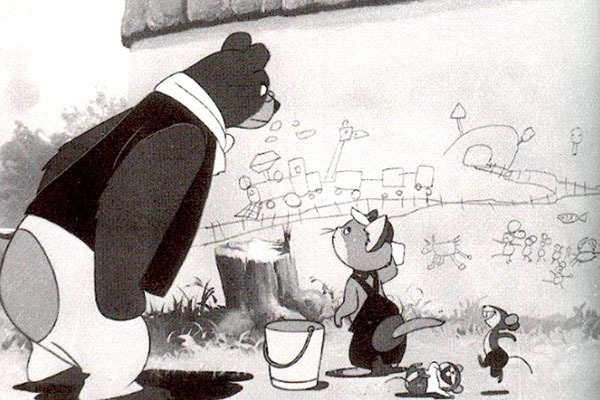 Re “The Out-Foxed Fox”: That’s “Kousagi monogatari” (“Story of a small rabbit”), produced by Yamamoto Sanae’s studio Nichidô Eiga, script by Yabushita Taiji (who directed, among much else, “Panda and the Magic Serpent” = “Hakujaden”, 1958, for Toei), direction and genga by Mori Yasuji; completed in March 1954. Watanabe Yasushi (Nihon animêshon eiga-shi; p. 245) regrets that it was made in monochrome. Re: “The Scribbling Kitten” (“Koneko no rakugaki”): This was produced, in monochrome, for Toei’s Educational Film Section mostly by former Nichidô staff in their new Toei studio building at a cost of 3,407,000 Yen. (Nihon animêshon eiga-shi; p. 63). Thanks Freddy – You are truly the anime historians historian! You could sorta say they were learning very well from the masters. it certainly gave them an edge to their work. That was in 2014 and has long been taken off the internet. But thanks for reminding me! I remember seeing some of the Prof. Baltazar shorts on the old Nickelodeon show Pinwheel. They always showed some good European and Canadian shorts. Regarding Scribbling Kitten, I love how the animators took the time to make the kitten’s drawings look like a real child’s drawings and give them movements to match. The incredibly appealing designs already show hints of modern anime styling.